By a rough estimate (and with some help from Athlinks.com), I figure that I have crossed over 40 finish lines in the past five years. Crossing that line comes with such a mixture of emotions, happiness, relief, disappointment, and sometimes overwhelming joy. On Sunday, our Girls on the Run group ran the Sparkle and Shine 5K (complete with a pre-race glitter and hair station, of which I did not partake). Every girl ran with a mentor or coach, most ran with a parent or relative. The girls have been training hard for the last three months to be able to run a 5K, and they made amazing progress. At the beginning of our program, some of the girls couldn't run one lap around our make-shift track (about 300 meters of grass around the elementary school playgrounds and baseball fields) without a walk break. They ran that loop hundreds of times, sometimes incorporating games and rest breaks to make the workout seem easier. On Sunday, that work paid off as all of the girls finished the 5K. 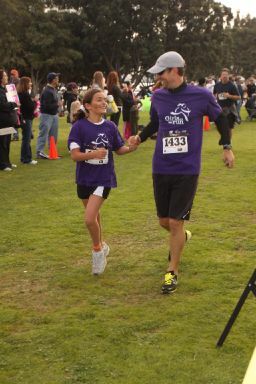 My daughter asked me to run the 5K with her. She had two goals, to beat her previous time and to run the entire 3.1 miles without walking, something she had never done before. Before the race, I told her to take it easy, especially at the start, then at the end, if she had anything left, to push hard to the finish. I ran alongside her, sometimes a little behind to let her dictate the pace, offering words of encouragement and I tried to be mindful not to push her to run faster, this was her race, not mine. She ran steady, with a smile on her face, sometimes breathing hard and we'd slow a little to help her recover. As we turned the last corner before the finish, she heard footsteps behind her, and she ran, pumping her arms and stretching out her legs, with a smile on her face, sprinting towards the line confident that she had accomplished both of her goals. As we finished, she grabbed my hand, or maybe I grabbed hers, and of all the finish lines I have crossed, this one was the sweetest. What a sweet post! So proud of Sophie. What a great program. Sitting here in waiting room to do my pft's and meet w/ my tx docs and I have tears streaming down my face!! I love this post and the picture so so much! Good job Soph, I'm so proud of you and totally inspired! I love running with my kids - great post. Though admittedly the finish photo could have used more pre-race glitter and hair action. Tears and pride. Congratulations to both of you. I love you! Go Sophie! Send her our love! Great post! I got to run with my older boys in their first 5k last year (they were 10). There's nothing better than being able to be there along side them as they experience the personal pride that comes with knowing they pushed themselves hard to accomplish a goal. I can see that seed growing in them this year as they strive to lead their school in miles for the 100 mile club. So far so good!